Concrete sidewalk repair and installation in the Norman, Oklahoma area requires a team of specialists that understand how the ground in this area can affect your sidewalks. Bill’s Custom Concrete has been providing the residents of the Oklahoma City Metro area professional concrete service since 1976. We completely understand that a sidewalk needs to be built properly the first time or it will simply crack and break apart from the movement of the clay ground as the temperatures here in Oklahoma freeze and then thaw. That damage can become so extensive that no repair possible can fix the sidewalk. Bill’s Custom Concrete will create a concrete sidewalk for your Norman home or business that will withstand those ever changing conditions and look beautiful for years to come. Bill’s Custom Concrete has been producing high quality concrete sidewalks around Norman and the surrounding area for almost four decades, and in that time we have see our share of sidewalks that were not created correctly and are now broken down chunks of rubble that pose safety hazards for anyone walking on them. We place each and every customers needs first and foremost, and out attention to details is unrivaled in the concrete industry. Call us today for a free consultation and we will walk you through the entire process from initial concept to finished product. 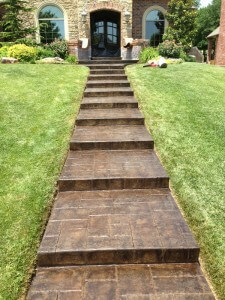 Please call us today at (405)755-3975 and let us create a one of a kind concrete sidewalk for you.